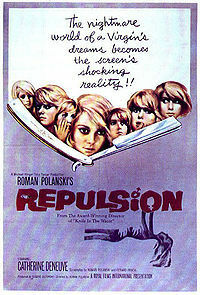 Repulsion is a 1965 film directed by Roman Polanski on a scenario by Gerard Brach and Roman Polanski. It was Polanski's first English language film, and was filmed in Britain, as such being his second film made outside his native Poland. The cast includes Catherine Deneuve, Ian Hendry, John Fraser, Yvonne Furneaux, with a cameo appearance by Roman Polanski himself. It is widely considered a masterpiece of the psychological thriller genre.